Junior Tiffany DeFelice led the No. 3/9 University of Florida softball team to a 6-1 victory over the Jacksonville Dolphins in the Gators' first home contest of the 2010 season. DeFelice went 3-for-3 with two home runs and three RBIs while tallying Florida's eighth and ninth bombs of the young season. Junior Stephanie Brombacher earned the win for the Gators (4-1, 0-0 SEC) by only allowing two hits, one run and striking out a season-high nine. The righty (3-1) started the game by striking out the side to keep the Dolphins off the board, their only run not coming until the third inning. Ashley Iveson (1-1) shouldered the loss for the Dolphins (4-1, 0-0 A-Sun), going 2.1 innings and giving up five hits, four runs, one walk and striking out three. 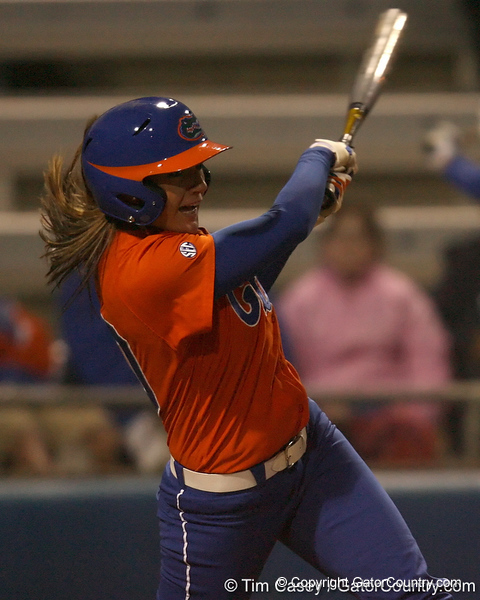 The Gators' first hit of the season at Katie Pressly Seashole Stadium came in the bottom on the second in the form of a bomb by DeFelice off the left-field foul pole. Her first home run of the season also brought home junior Kelsey Bruder, who walked to reach first. DeFelice opened up the fourth with her second homer of the game, this one bouncing off of the scoreboard.